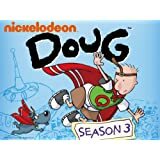 Doug premiered on NIK on August 11, 1991. Life isn't always a barrel of laughs for Doug Funnie. He's just started junior high in a new school, he gets pushed around by a bully named Roger Klotz, and he's not exactly a smooth talker around his dream girl, Patti Mayonnaise. But if there's one thing Doug's good at it's creative thinking. He's like a warehouse of imagination packed into a V-neck sweater-which is a good thing, since he always seems to wind up in some sort of a jam. It might not always be easy, but with the help of his dog Porkchop and his best friend Skeeter, Doug usually ends up landing on his feet. And if he surprises some people along the way, well, no one is quite as surprised by Doug as Doug himself. Doug's Fat Cat/Doug And Patti P.I. Doug Inc./Doug's Nightmare On Jumbo St.